We are delighted that you are considering bringing your child for baptism at St Mary's or seeking it for yourself. When you have read the information below, please contact our volunteer Baptisms Coordinator, Lyndsey Duncan at . Please also include your full address and contact phone number with your enquiry. All matters set out herein are subject to confirmation. 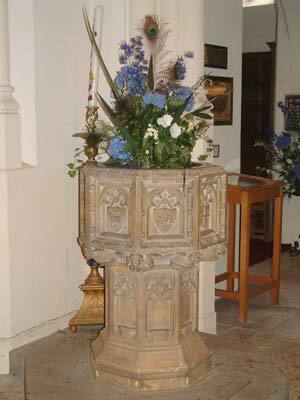 We live in the Parish and would like our baby/child baptised at St Mary's. And/or we already regularly attend the church. What should we do? In either of these circumstances you can just phone the office to make an appointment to attend a Baptism Surgery. These take place between 9:30am and 11am in the Parish Office on specified Saturday mornings with the one of our clergy. They only last 15 minutes. Please bring your diary with you to this meeting. At the session the priest will take your details, have a short discussion with you and offer you a date for the Baptism Preparation Session and the Baptism itself. The Preparation session lasts half an hour and will be in church with other parents, and any Godparents who are able to join you. Please bring the child who is going to be baptised and any older siblings to this session. We do not attend the church. Is it still possible to have a baptism here? Yes, of course, but we do encourage all parents to become involved in the life of the church and make a firm commitment to bring their child up in the Christian faith. We do not live in the parish and we do not attend the church. Can we still have a baptism here? You would either need to start attending church, or get a letter of permission from the Vicar of the parish you live in. You can find out which parish you live in at www.achurchnearyou.com. We offer baptisms twice a month, except in December. We have one Baptism service a month at The Service @ 11:15 and one a month at 12:30pm on a Sunday; this service does not have any hymns and usually lasts about 20 minutes. Will our baby be the only one? No, we cannot guarantee a private baptism. However, we do not have more than three families, or five children being baptised at the same time, which ever is the fewer. No charge is made for baptism but you are welcome to make a donation to church funds. Is there a form to fill in? Yes there is, this will be given to you at the Baptism Surgery, please complete and return it to the Parish Office as quickly as you are able to do so. It will contain requests for information about Godparents as well as your own details. Do we and/or the Godparents need to have been baptised and confirmed? Godparents must have been baptised, as Parents and Godparents make promises to bring children up in the Christian faith. Parents do not need to be baptised. Could we have a party afterwards in one of the church halls? If they are available, this should be possible. Please visit the Halls section of our website.